A really good article. God Bless Her. 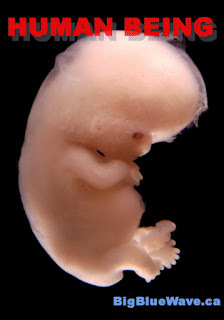 Section 223 speaks primarily of the fetus (unborn child) as “a child” — “a child becomes a human being.” That’s to recognize it as human, because only humans have and are children: cats have kittens, dogs have puppies and hens have chickens. So, the unborn child is a “human being”, just not “within the meaning of” that term in the homicide provisions in the Criminal Code. But really, it's not an abortion debate. It's a fetus debate. There's more to this than abortion. This affects unborn victims of crime, stem cell research, maybe even fetal medicine.